Heather noticed that perhaps because of the rain there were less people, but the people who did come by our booth wanted to talk a little more. Here are some of them. First, there was Robert Chaplin. I bought two copies of his independently published book Ten Counting Cat. I love picture books that look like they are kids books, but really aren’t. Here’ s a video of the same book. One of my favourite publishers, Simply Read, was vending beside us. 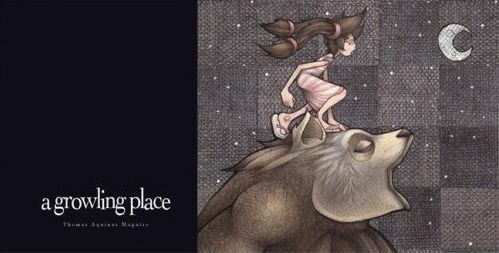 I got a copy of A Growling Place for only $10. A friend recently reviewed it, and we agreed that the art was beautiful, dark, Sendakian and not really a little kids book. Another children’s author came by and told us that her publisher told her she can’t use the words gold medal, Olympics and downhill skiing in her upcoming book. Apparently they’ve been trademarked by the 2010 folks. We agreed that this was completely absurd. Robert Chaplin encouraged her to publish independently and then disappeared into the rain. We also met a retired school librarian who was frustrated that American schools have educational exemption and can show Hollywood movies in their classrooms, but Canadian schools have to pay a lisencing fee to show the same films in classrooms. Lots of the CUPE 391 library workers, who organized a parallel event, Word on the Strike, also came by. Yesterday 11 members of the Intellectual Freedom and Information Policy Committees braved the cold, wet, windy weather to entertain and educate at the Word on the Street literacy and book festival. Everyone had their own unique way of drawing people in.A Sylvia was like a carnival barker, or the guy who demonstrates super absorbent towels at the Richmond Night Market as she drew people in with “Spin the wheel!A Answer a question!A Win a candy!A There are no wrong answers!” She was unstoppable. 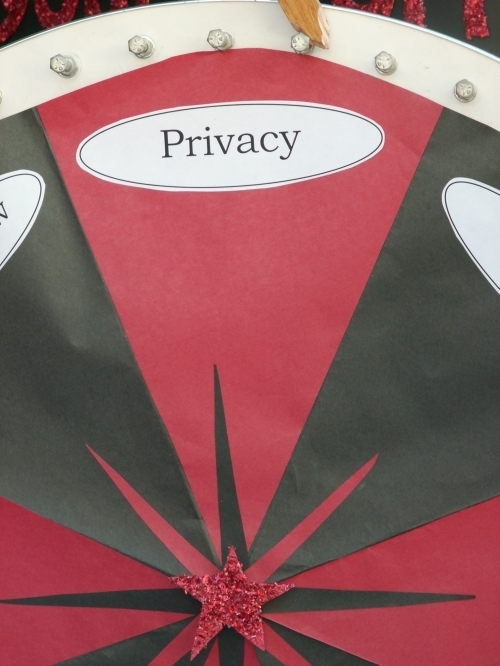 We invited people to spin the wheel and answer a question on an information policy or intellectual freedom issue.A Contestants got a candy if they got the question right or wrong.A This year we revised the questions to have kid friendly options.A My favourite kid questions were the ones Devon revised on pay equity, net neutrality and whistleblower protection. A Check out the questions (.doc). I was surprised at how many people were out enjoying the festival despite the nasty Vancouver weather.A I was also a bit surprised at how interested people (kids and adults) were to learn more about DRM.A I also enjoyed catching up with other library folks, meeting authors and random people who had been active in IF and IP issues.A More about them soon. Look for our booth (with the Information Policy Committee) at Word on the Street. 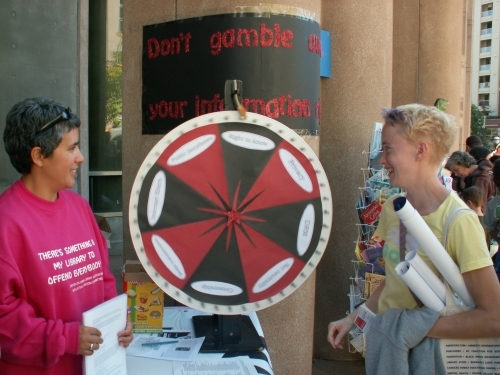 Spin the wheel, answer an information policy or intellectual freedom question and get some candy. Get there early to buy a treasure hunt book bag for $18 at the information tent. We are one of the booths that is giving away something to folks with these bags. Due to the library workers strike the booths will be moved onto the street, so you can come to the event and not worry about crossing the picket line. CUPE 391, the union representing Vancouver library workers, will also have a booth. We will be at Word on the Street Sunday, September 30th with the Information Policy Committee to host our wheel of information issues. Last year the wheel was really successful, our booth was busy all day long. Perhaps people were excited about learning more about privacy issues and net neutrality. Perhaps they just enjoyed the satisfying clack-clack-clack that the wheel made. Perhaps it was the gummi candy. Check out the planning wiki if you would like to get involved.